The Ivanpah Solar Electric Generating System is a massive 392 MW solar farm being built in the Mojave desert. Its investors include Google, NRG Energy (one of the largest energy companies in the US), and BrightSource Energy (which is the lead developer). At 392 MW, the Ivanpah Solar Electric Generating System will be the largest solar thermal power plant in the world. And it will be the second-biggest solar power plant of any type. (That is, if you count the massive 600 MW Gujarat Solar Park as a single power plant — it is actually several solar parks, some of which are quite spread out.) At 392 MW, Ivanpah will be able to produce enough electricity for up to approximately 392,000 average US homes. In other words, Ivanpah is huge. And that huge solar power plant just hit a very notable milestone this week — it “produced its first output of energy when the Unit 1 station was synced to the power grid for the first time,” as an NRG Energy press release noted. In case you’re not familiar with the plant and are now curious about it, the first thing to know (…well, other than the jazz above) is that it is nothing like the solar PV panels on your roof. (You do have solar panels on your roof, right?) Solar PV panels turn light into electricity through the photovoltaic effect. Ivanpah, and other concentrated solar thermal power plants like it, direct sunlight onto something in order to then heat water enough to produce steam to then turn a turbine and create electricity. 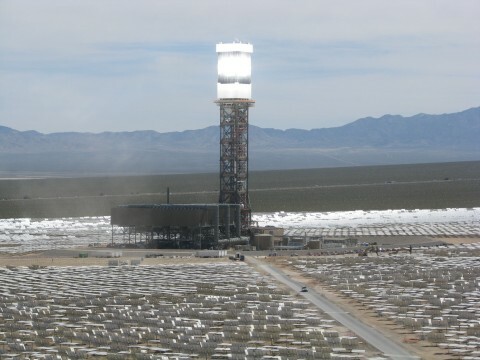 In the case of Ivanpah, sunlight is directed onto a tower using heliostats (i.e., mirrors that can automatically follow the sun). It’s pretty cool. And it’s great to see this technology moving along. We will need various sources of clean electricity as we cut our use of fossil fuels and nuclear energy. But there is a thing or two more to note about this technology. The main thing is that concentrated solar thermal power (CSP) was once considered more cost-competitive than solar PV, but following solar PV’s massive cost drop, it is no longer competitive except in some very unique situations. I was actually given a tour of the largest single-unit CSP plant in the world back in January. I did find out the projected price of the electricity produced by that plant, and while I can’t repeat it, I can tell you that it was much higher than what solar PV is now at. Back when some of these large CSP power plants were begun, it was simply a different story. Several CSP plants have actually been cancelled, postponed, or switched to solar PV technology in the past couple of years as a result. For the ones that make it to development, it’s great to see them get there. And CSP may indeed become more competitive again in the future. But, for now, putting solar panels on rooftops is much cheaper — just one reason why rooftop solar power is growing so fast.